This Saturday marks what is sure to be a fun Halloween, but it also heralds the 95th anniversary of Frederick Banting’s idea which led to the discovery of insulin. Early in the morning on October 31, 1920, Banting arose from his bed after mulling over the journals he had been reading for a lecture, and wrote down a twenty-five word hypothesis. This idea sparked him into action, and he quickly began his research that led to the development of insulin. 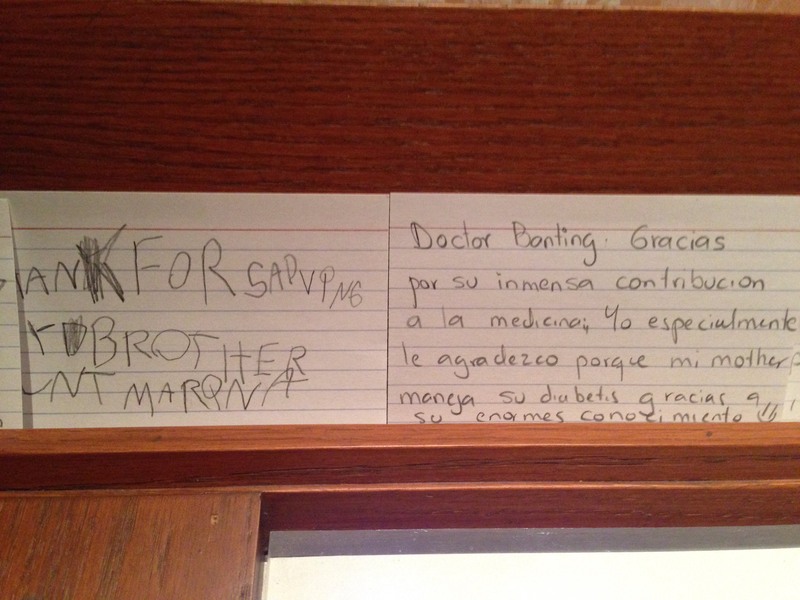 Some of the letters left for Dr. Banting. As the 95th anniversary approaches this weekend, it’s a great time to come out and visit Banting House, and to take time to read the letters in his bedroom. I also encourage everyone to read the comments on the the Dear Dr. Banting page on our website if you are not able to make it to the museum, and to write one yourself if you have something to share.